As the name might suggest, the Roadster 26 shares its heritage with our classic Roadster but has been specifically adapted for the shorter gentleman . 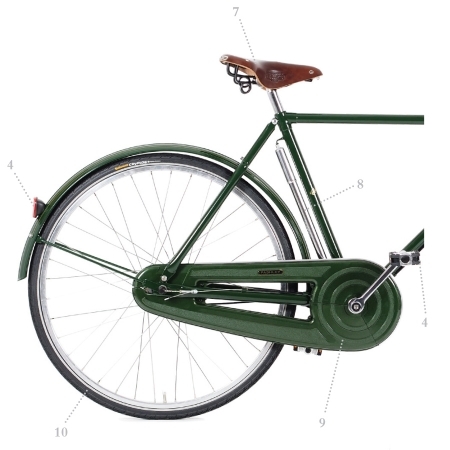 Have you found the Pashley Roadster 26 Classic 3 Speed Mens Black Cheaper? 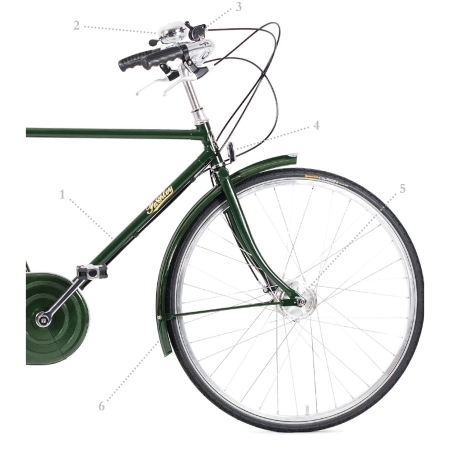 It employs smaller 26 inch wheels and has a lower bottom bracket, but the Roadster 26 retains all the refinement and elegance of the traditional British town bicycle. The handmade Brooks B72 leather saddle lets you ride in the utmost comfort, and the combination of a fully enclosed chaincase and enamelled mudguards keeps you clean and looking good as you enjoy the smooth experience. Its elegance is matched by the quality of components, such as the reliable hub brakes and Schwalbe puncture resistant tyres, all of which bring the very best of modern technology to this most iconic of cycles. For further customisation there are two versions of this model: the Roadster 26 Classic, with 3 speed hub gears for lightweight reliability and simplicity, and the Sovereign, which features 5 speed hub gears for all terrains, a handy frame-fitted lock and a front dynamo headlamp that never needs batteries. The Roadster 26 can therefore be seen as the best of old fashioned gentlemanly cycling but with the benefits of a smaller frame and high end modern componentry, giving you a lifetime of riding pleasure. Smaller Roadster frame with classic geometry and elegant upright riding position: Comfortable 'sit up and beg' style upright riding position that allows you a good view of other road users and the scenery, and the added bonus of encouraging a healthy posture. With a lower bottom bracket and correspondingly lower stand-over height for ease of mounting and dismounting. The frame is hand-built using 100 year old traditional methods - with tubing hand-brazed into lugs - for the attention to detail that only a frame crafted by hand can possess. Reflectors for added visibility: front, rear, tyre and pedal reflectors all help to keep you safer on the road at night. Traditional Brooks B72 leather sprung saddle: Classically sprung for supreme comfort. First released in 1935, it's a lightweight touring saddle with unique loop springs incorporated within the saddle. The leather allows the saddle to breathe and form to your shape over time becoming uniquely comfortable. With handy rear luggage loops. Colours Buckingham Black or Regency Green. Saddle Brown Brooks B72 natural leather saddle with loop spring frame. Tyres 26x1 3/8" Continental City Ride tyres with puncture protection. Other Features Fully-enclosed chaincase, large ding-dong bell, frame-fitted pump. Frames Sizes 20" (suitable for an inside leg of 27-31"). What do you think of Pashley Roadster 26 Classic 3 Speed Mens Black?